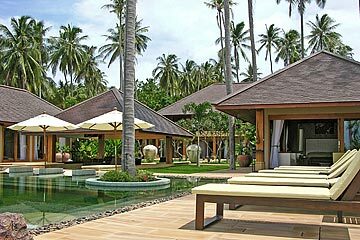 Grand luxury set on a tranquil beachfront, this villa is the cutting edge of contemporary tropical architectural design. Amenities Apple TV, X-BOX 360, WiFi internet, iPad/iPhone docks and satellite TV in all bedrooms, 120" outdoor HD projector, air-con bedrooms, fully equipped kitchen, BBQ, 2 sea kayaks, paddle board, Jacuzzi, spa and steam room. Ban Mekkala is a sumptuously specified beachfront villa, designed by renowned architect, David Clarke. The villa is set within a large and well-planned walled and landscaped garden, and set on a quiet and secluded beach on the far south coast of the island, a short stroll away from the landmark Golden Pagoda. Entered through a huge sliding gate, to a private courtyard with double car port and staff house, a further gate opens onto a bridge across an ornamental pond with fountains, leading to the reception room. The vast reception hall integrates a state-of-the-art kitchen, with a dining area seating 12, and an extensive lounge area with sofas arranged around a coffee table and plasma TV with satellite and DVD. Wooden floors and wood-paneled vaulted ceiling are complemented by Thai art and artifacts. Large glass doors open onto an immense deck, which is partially covered by the overhanging roof, with colonial loungers and coffee tables, overlooking the pool, garden, and sea. Open stairways lead down to the ground floor from both ends of the upper deck. Downstairs, 2 adjacent bedrooms are located below the reception room. Approaching the beach from the main villa, over sandstone stepping stones across the lawn, two detached en-suite bedroom units are passed on either side of the property. All of the six bedrooms feature wardrobes, dimmer controlled halogen lighting, individual safes, and TV, with DVD and stereo. The generously proportioned air-conditioned double bedrooms each have large en-suite bathrooms, with free-standing oval terrazzo bath tubs, separate glass-encapsulated rain showers, and additional outdoor rain showers in romantic tropical garden settings. Each bedroom features a deck, with a pair of colonial loungers overlooking the garden and sea. A private spa is set within a large courtyard adjacent to one of the bedrooms in the main building. A sandstone deck provides ample of space for massages, and is flanked by a large water feature with a waterfall into an ornamental pond, with a sunken Jacuzzi in the centre. A central pavilion adjacent to the swimming pool includes a dining setting for 14, swim-up bar, plasma TV screen, and stereo speakers. Stereo is also piped through most of the open-air areas around the villa. The distinctive pool tiled in stone tile, and surrounded by a sandstone deck. Sun loungers are integrated into the pool, providing a floatation effect. A section of grass lawn beyond the pool runs to the low wall, beyond which the beach is accessed through a gate. A barbeque and outdoor kitchen area is ideal for preparing fresh seafood dinner parties in the al-fresco poolside sala pavilion. Ban Mekkala is one of Koh Samui’s most lavishly appointed homes, offering the utmost in luxury and service. A Thai chef is available to cater for any meals required, and the in-house manager and staff are always on call to cater to your every whim. Massages, spa treatments, and other forms of pampering can be arranged at the villa, to ensure that your experience surpasses expectations. The villa is very well designed and coordinated, offering equivalent levels of comfort to all guests. Ban Mekkala is equally well-suited to family holidays, friends’ reunions, and corporate meetings or leases. For larger parties, Ban Mekkala can be combined with the neighbouring sister property, Baan Wanora. *3 bedroom occupancy rate of $1500++ USD until 31 August 2018, and $1300++ USD from 1 September-14 December 2018.